New study reveals key step in allergic reactions. By studying the mode of action of the interleukin-33 protein, an alarmin for white blood cells, a team at the Institut de Pharmacologie et de Biologie Structurale has been able to evidence truncated forms of the protein that act as potent activators of the cells responsible for triggering allergic reactions. This breakthrough in the understanding of the mechanisms underlying allergy could have important applications in the treatment of asthma and other allergic diseases such as eczema and allergic rhinitis. The study is published in PNAS. An allergy is a hypersensitivity disorder of the immune system. Symptoms include red eyes, itchiness, and runny nose, eczema, hives, or an asthma attack. In some people, severe allergies to environmental or dietary allergens or to medication may result in life-threatening reactions called anaphylaxis. Food allergies and reactions to the venom of stinging insects such as wasps and bees are more often associated with these severe reactions. Allergic reactions occur when a person’s immune system reacts to normally harmless substances in the environment. A substance that causes a reaction is called an allergen. These reactions are acquired, predictable, and rapid. Allergy is one of four forms of hypersensitivity and is formally called type I (or immediate) hypersensitivity. Previous studies have shown that allergic reactions are distinctive because of excessive activation of certain white blood cells called mast cells and basophils by a type of antibody called Immunoglobulin E (IgE). This reaction results in an inflammatory response which can range from uncomfortable to dangerous. Treatments for allergies include avoiding known allergens, steroids that modify the immune system in general, and medications such as antihistamines and decongestants which reduce symptoms. Many of these medications are taken by mouth, although epinephrine, which is used to treat anaphylactic reactions, is injected. Immunotherapy uses injected allergens to desensitize the body’s response. Interleukin-33 (IL-33), discovered in 2003 by the team, is a protein in the family of interleukins, soluble messengers that enable communication between cells in the immune system and play a crucial role in tissue inflammation. This protein, which is stored in the blood vessels, lungs, skin or intestine, is only released in the event of cell damage. It acts as an alarmin that warns the body of trauma or infection by stimulating numerous cells in the immune system. For several years, researchers have been trying to understand how the activity of interleukin-33 is regulated. They have now discovered that the protein is released by damaged cells and is then truncated by enzymes secreted by mastocytes, white blood cells that are key factors in allergy. By amplifying the danger signal to the immune system, these truncated forms have been shown to be 30 times more potent than the original form of interleukin-33. The scientists have demonstrated that this highly potent signal is able to alert cells related to lymphocytes, group 2 innate lymphoid cells (ILC2). By triggering the chain reactions responsible for the allergic symptoms of asthma, eczema or allergic rhinitis, these cells have an essential role in allergy. For the research team, preventing production of the truncated forms of interleukin-33 in order to reduce the allergic reactions triggered by ILC2 represents a promising strategy for the treatment of asthma and other allergic diseases. 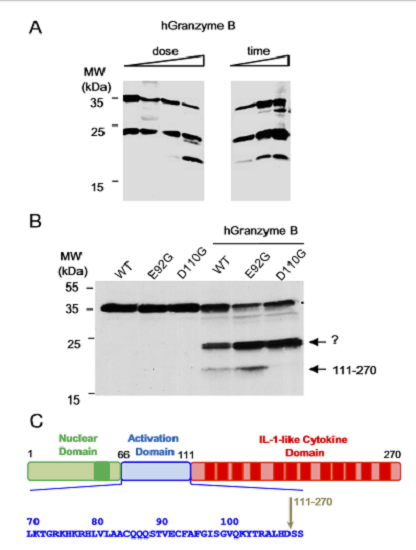 Human full-length IL-33 protein is a substrate for granzyme B. (A) In vitro translated full-length human IL-33 1–270 was incubated with purified human granzyme B (Left) increasing amounts up to 0.3 units; (Right) increased time from 5 min to 1 h. Proteins were separated by SDS/PAGE and revealed by Western blot with anti–IL-33–Cter mAb 305B. Blots are representative of two independent experiments. (B) Mutation of D110 to glycine in full-length IL-33 inhibits formation of the 18-kDa granzyme B cleavage product. In vitro translated full-length human IL-33 1–270 or single point mutants IL-33 E92G (E92G) and IL-33 D110G (D110G) were incubated with purified human granzyme B (0.3 units, 1 h at 37 °C). (C) Mapping of the granzyme B cleavage site in the central domain of IL-33 (amino acids 66–111). The sequence surrounding the granzyme B cleavage site is shown. Central domain of IL-33 is cleaved by mast cell proteases for potent activation of group-2 innate lymphoid cells. Girard et al 2014.